Every year, over 13 million children under the age of five years die from illnesses which could have been avoided or treated (1). Food shortage, lack of drinking water and lack of a proper sanitation system are the primary causes of illnesses in the low resources settings. Lack of awareness education and proper employment further deteriorate their health conditions. Most developing countries usually don’t have enough staff and healthcare equipment to offer healthcare access to the most in need. Many countries in Africa and South East Asia only count 1 doctor for over 2000 inhabitants; this is 6 times less than in developed countries (2-3). The primary motive of this work is to address the acute lack of affordable medical technologies in low-resource settings in order to reduce child mortality in the neonatal period. It is essential to develop affordable medical devices for empowering health workers and village doctors and train them to use smart devices and appropriate ICT tools, and connect them to the medical experts wherever available to manage the serious health problems. The work includes: a) identifying the needs in the local conditions and accordingly creating access to essential and cost effective medical devices; b) developing programs for safe use of devices and manage consultation with the medical experts and c) developing appropriate e-Learning content on health education for disease prevention. 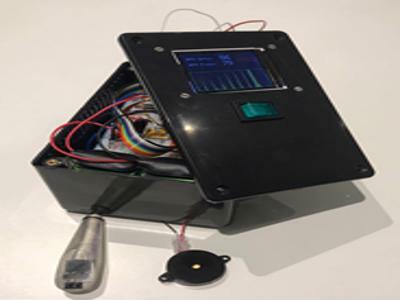 A handheld, safe and user friendly heart rate monitor has been developed using smart and low cost sensors. The device consists of two major parts. First, low cost sensors (piezo and optical) interfaced with analogic front-end circuits including capacitors, resistors and amplifiers. Second, the filtered and amplified signal is digitally processed and converted to provide statistically significant information about the patient’s heart rate and present irregularity in the heart activity if any. The arterial pulse pressure is detected on the radial artery protrusion near the wrist by the piezoelectric and the pulse rate from a fingertip is simultaneously registered by the photoelectric sensor. The piezoelectric sensor head is placed on the point where the radial artery crosses the bones of the wrist, whereas the photoelectric sensor head is placed on a fingertip in order to detect the arterial pulse.